The Big 12 has had their quarterbacks stamped all over the Heisman Trophy lists all season long as Oklahoma QB Kyler Murray has done his best at replacing last year’s winner, Baker Mayfield. While offense takes the center stage in the conference, there have been several standouts on defense as well. 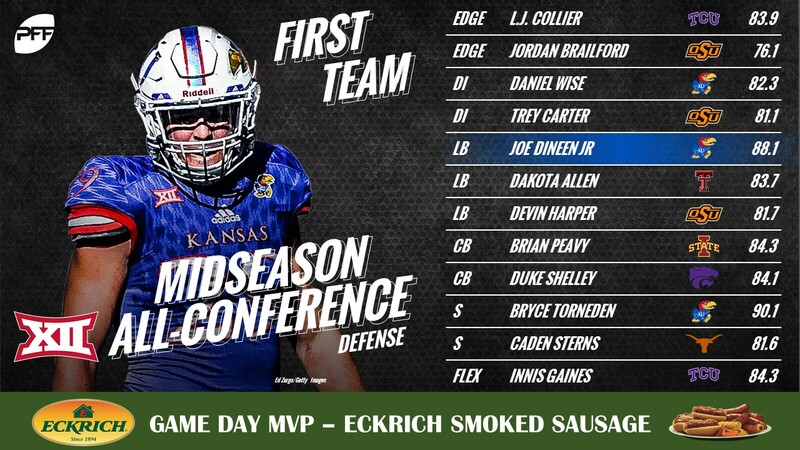 Joe Dineen has put forth an incredible start to his final season at Kansas as the Jayhawks got their first back-to-back wins against Power-5 competition in some time earlier this season. 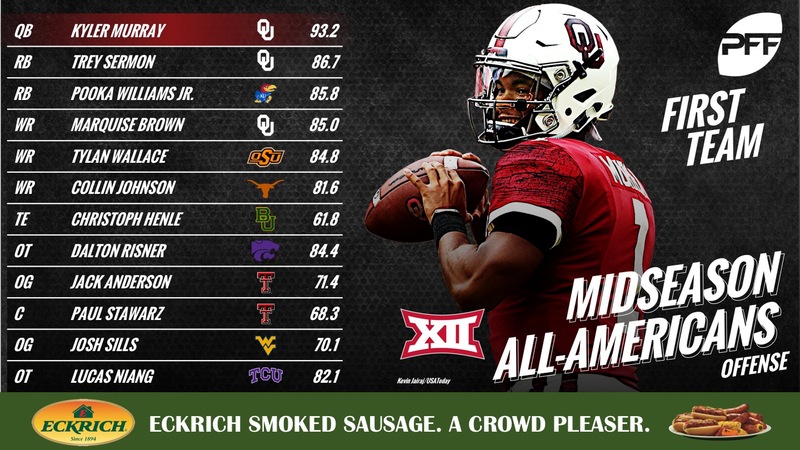 The PFF Midseason All-Big 12 Team is brought to you by Eckrich, the Official Smoked Sausage of the College Football Playoff. Second in our Heisman rankings (coming Wednesday), what Murray has done in his first season as a starter in Norman cannot be understated. Sure, they lost to Texas, but his 13.1 yards per attempt are a full 3.2 yards ahead of the next closest quarterback with at least 100 attempts (Will Grier). Injuries to the Sooner backfield has pushed Sermon to the forefront of their rushing attack, yet they seemingly haven’t missed a step without Rodney Anderson. Sermon has recorded 11 runs of 10 or more yards and averages a healthy 3.64 yards after contact per rush. A stalwart on our list of top true freshmen, Williams’ debut season for the Jayhawks has been extraordinary. On 72 carries, he’s recorded 556 yards, averaging 7.7 yards per attempt and 4.72 yards after contact per carry. Aptly nicknamed ‘Hollywood,’ Brown should be seeing the bright lights of the national limelight as long as he’s on the field this season. On 33 catches, he’s average 10.0 yards after the catch per reception and forced eight missed tackles. Wallace leads the nation with 14 contested catches this season, hauling in a conference-best 716 yards through the air, averaging 17.6 yards per reception. His 379 yards on deep passes (20-plus yards in the air) are first in the conference as well. Highlight-reel catch after highlight-reel catch, Johnson continues to stand out at Texas. He’s gained a total of 162 yards after the catch this season and forced eight missed tackles and is third in the conference with 260 yards on deep passes. Living up to his preseason billing and being named to our Midseason All-American Team, Risner has once again put up strong numbers for the Wildcats. On 227 pass-blocking snaps, he’s allowed just two pressures including not allowing a sack. Anderson has blocked well in both facets for the Red Raiders, allowing just six total pressures on a whopping 307 snaps in pass protection, while holding the conference’s best run-blocking grade among guards. On 269 snaps in pass protection, Stawarz has allowed just seven hurries, most importantly, holding interior pass-rushers without a sack or hit on Texas Tech quarterbacks. Sillis is tied with Anderson for top run-blocking grade while he himself has allowed just six total QB pressures on 227 snaps in pass protection. The second-highest graded tackle in the conference, Niang is right behind Risner in terms of pass-blocking. On 239 snaps in pass protection, he’s allowed just three pressures, not one of those being a sack. Collier has been as solid as you’d expect for the Horned Frogs, not missing a single tackle attempt this season while also bringing in 19 total QB pressures. He’s gotten to the quarterback on eight of those occasions, bringing home four sacks and four hits. Brailford has been a tackling machine, even if he’s missed eight of his 31 total tackle attempts this season. He’s recorded 19 solo tackles and combining those with his six sacks, is second among Big 12 edge defenders with his 18 total defensive stops. Wise plays all across the line for Kansas but sees the majority of his work come from the interior of the defensive line. On his 151 pass-rushing snaps, he’s recorded 12 QB pressures, including four sacks and an additional six defensive stops in run defense. Carter finds himself third in total QB pressures among interior defensive linemen in the Big 12 with 14, recording three sacks, one QB hit and an additional 10 hurries. He’s recorded a total of 10 defensive stops as well. Long since a run-stopping machine, Dineen is poised to record at least 40 defensive stops for the third time in four seasons. Rounding out his game this season, He’s allowed just 44 yards after the catch on 181 snaps in coverage and a career-best 80.4 passer rating on throws into his coverage. Allen has been dominant for two seasons now since returning to Texas Tech after a stop at East Mississippi Community College (and on Last Chance U, of course). He’s recorded two pass breakups this year while also bringing in 10 pressures on 27 blitzes and been his usual dominant self, racking up 50 tackles by PFF’s accord, and only missing two attempts all season long. Rotating in the Cowboys defense, Harper has been a valuable asset, recording a total of 14 defensive stops while also bringing in an interception on 11 targets as the primary coverage defender. Peavy could have entered the 2018 NFL Draft and likely heard his name called sooner than later but returned to the Cyclones for another year. Iowa State fans must be happy he has as he’s limited receivers to just two yards after the catch on 18 total targets including four pass breakups as he’s on pace to match his career-year last year in PFF grading. Shelley has already been targeted 53 times this season, allowing 27 receptions and limiting receivers to just 37 yards after the catch. His 11 total plays on the ball are the most in the conference as he’s recorded three interceptions and eight pass breakups. A force all over the field, Torneden has made the splash plays to turn him into a household name by season’s end. On 12 pass-rushes, he’s brought in four pressures, made 50 total tackles and allowed a passer rating of 52.1 on 11 targets as the primary coverage defender. The true freshman has stood out this season, bringing in a conference-high four interceptions among safeties. All told, he’s been targeted in his primary coverage 17 times, allowed six receptions and brought in four interceptions and two additional pass breakups for a 7.1 passer rating against. Gaines has been sent on a blitz on 18 snaps, bringing home a sack, a hit and two more hurries. In coverage, he’s limited receivers to just 4.9 yards per catch and a catch no longer than nine yards this year.